What a delight to see our Judiciary having come so far away from the days of Mahinda Rajapaksa rule; cleansed from the appalling spell and smell of Sarath N. de Silva and Mohan Peiris! The nation feels relieved that a dangerously developing nightmare has been put to an end. Sure, the decision isn’t complete and we have to wait for December. Yet, the command to suspend the dissolution is itself something considerable to celebrate. We get to expect that whatever happens in December will be for our society’s good health and that the rule of law will come to stay as the very bedrock of our people’s freedom. We are out of a bad, bad dream! Our Judiciary has proved itself, true to public expectation, as the people’s last bulwark of freedom. Who says the Yahapalanaya revolution didn’t achieve anything? Can one imagine anything more substantial than the realisation that we have achieved something so important and so momentous for a decent and civilised society? It is necessary to recapitulate in order to appreciate to what point the Supreme Court decision has brought Sri Lankans. Under the Mahinda Rajapaksa decade, Sri Lanka was developing Hitler’s justice. The Chief Justice who cast a qualification on the Divi Neguma Bill of powerful powerbroker and Minister Basil Rajapaksa was impeached with scant respect for legal norms and qualms. Mahinda installed another man on the disgrace line as her successor. That line originated with Sarath Nanda Silva, former Chief Justice who began the destruction of a once great tradition of high quality justice that Sri Lanka enjoyed. People showed their evident displeasure in 2015 when the draconian regime defined by murder, theft, and a franchised system of corruption was overthrown by the vote. That vote was from 6.2 million people. One of the considerable achievements of the new Yahapalanaya Government was to restore the Judiciary’s independence. This cannot be honestly denied. With justice restored, the rule of law began to function, once again. That functioned so relentlessly that those of the defeated regime who had serious charges of corruption and criminality were afforded a very patient “due process,” to defend themselves. This was both a strength of Yahapalanaya and its weakness. It had been a weakness because it rendered adequate space for the “horu,” or rogues to try and break up the new Government. I think a fair criticism of the Yahapalanaya Government is that it should have set up the Special High Courts immediately after they got into reins of office; not wait until three whole years had passed. The space offered was gratefully accepted by Mahinda Rajapaksa, his family, and his cohorts to regroup and to attack. The Yahapalanaya Government to date suffered from that tactical lapse. 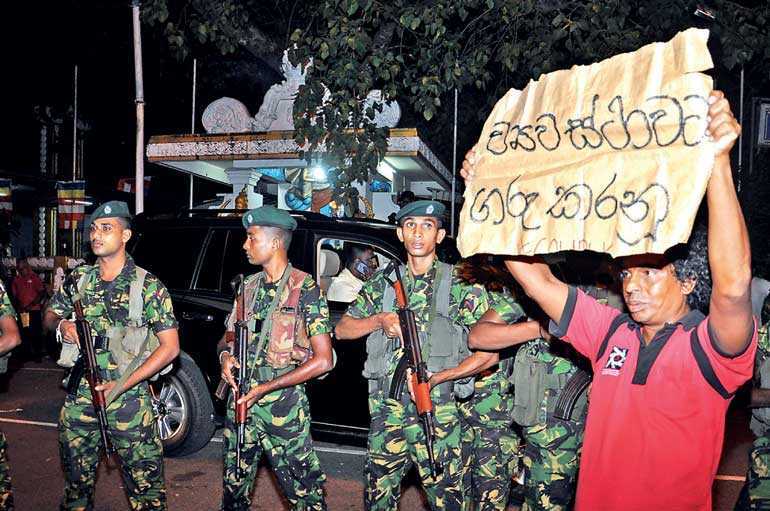 The defeated forces managed to skilfully play mind games on their official enemy, President Sirisena, and persuade the latter to do his second great U-turn. Sirisena, who tried to conjure up a strong SLFP, faulted and failed to do so. We see all those SLFPers crossing over to Mahinda’s new political party, the Pohottuwa. The SLFP is dead. Will that great conservative tradition set up by S.W.R.D. Bandaranaike to counter the Grand Old Party in a beautiful two-party democracy be cremated? That is the question. With successful communication, Mahinda managed to create the delusionary perception among people that he, single-handed, had “won back the country”. On the edifice of that illusion Mahinda and his men worked to abuse every institution in the island. Those who fail to understand the events of today haven’t comprehended one thing, namely, that Mahinda Rajapaksa grew among musclemen or ‘chandiyas,’ and that that culture is reflected in his persona. Mahinda is far removed from the educated and cultured classes. He is not in sync with anything that is intellectual. As a Minister he achieved nothing. As a president he browbeaten his way to an undeserved collective praise. That is the power of media communication. If you think I am biased, just reflect on the recent political atrocities that a Mahinda-led evil force have created: They get Sirisena to sack the Prime Minister, Ranil Wickremesinghe, in sharp violation of the Constitution. That was the first mutilation of the Constitution. Ranil still lives in Temple Trees claiming he never was dispossessed from his position. The political marauders and chandiyas have taken away all Ranil’s security, thus generating an ironic laugh among us who recall how Ranil had afforded even Gota a full complement of security after they lost the election. The next browbeating was when these marauders got Sirisena to appoint Mahinda Rajapaksa as the replacement for Ranil. The man who lost the election replaced the man who won the election! The third violation of the Constitution was when Parliament was prorogued for as long as a month for no official reason. We all knew this was done to enable the marauding junta to rope in crossovers by bribery and portfolios. Gossip was high when stories spread about huge monetary rewards being offered for a cross-over. On a daily basis, new ‘ministers,’ were appointed to “fill vacancies,” created by “sackings”. Many of the new ministers were among those under bail over serious court cases. This made the new Cabinet smell like bad fish. Ministers like Professor G.L. Peiris and Sarath Amunugama, who know better, simply went with the flow of the mob. How easy it is to lose your soul and honour! Life is so cheap! Being thugs, it was easy for the new outfit to force out existing ministers and occupy the seats. The key Government electronic and printed media was seized by the junta marauders by the use of physical feats. Thugs lost no time in capturing Rupavahini and Lake House immediately. Led by the Speaker Karu Jayasuriya who played an honourable role, the UNP and the rest of the parties demanded that a vote be taken to legitimise the new PM. Despite heavy lobbying the junta boys couldn’t get the required numbers. This led to the fourth violation of the Constitution – when Parliament was dissolved. It doesn’t need much brain matter to realise that Sri Lanka was experiencing a revival of arbitrary rule- operating, as it did, outside the gamut of the Constitution. The country was dangerously heading to lawlessness by stealthy and crooked acts of the junta led by Sirisena and Mahinda. The latter kept defending themselves with holy rhetoric. Once the framework of the Constitution is broken and ruling thugs take the law into their hands, a new parallel universe of arbitrary rule by whim and fancy gets set in motion. The eventual destiny can only be speculated upon with total apprehension and fear. In the meantime, international support was being withdrawn and the Lankan economy was falling. My narrative connects with the brave and independent act of the Supreme Court at this point. As Ranil Wickremasinghe stated soon after the judgment, judges of our Supreme Court had been under severe pressure from the junta. One can imagine! Having withstood all that, our judges have won the respect of the people. What a glorious status to be in! The true power-base of the Judiciary is public respect.